Note: cooking mode is currently only available in our mobile apps (iOS, Android). Cooking mode was built to allow you to cook easier and completely hands-free, thereby keeping your mobile device clean and safe from water or oil mishaps. Instructions are separated so you can see (in large, easy to read font) exactly what you have to do right now. Here's how to use it! Open the Mealime app on your iPhone, navigate to the 'Meal Plan' screen and tap on a recipe you'd like to cook. Once there, tap on Instructions, then Open Cooking Mode. You can also navigate between instructions by tapping on the arrows. The down arrow will advance you to the next instruction while the up arrow will take you to the most recent previous instruction. Once you reach the final instruction and you've finished cooking, tap Done to mark the recipe as cooked and exit cooking mode. Open the Mealime app on your Android device, navigate to the 'Meal Plan' screen and tap on a recipe you'd like to cook. Once there, tap on Instructions, then Open Cooking Mode. 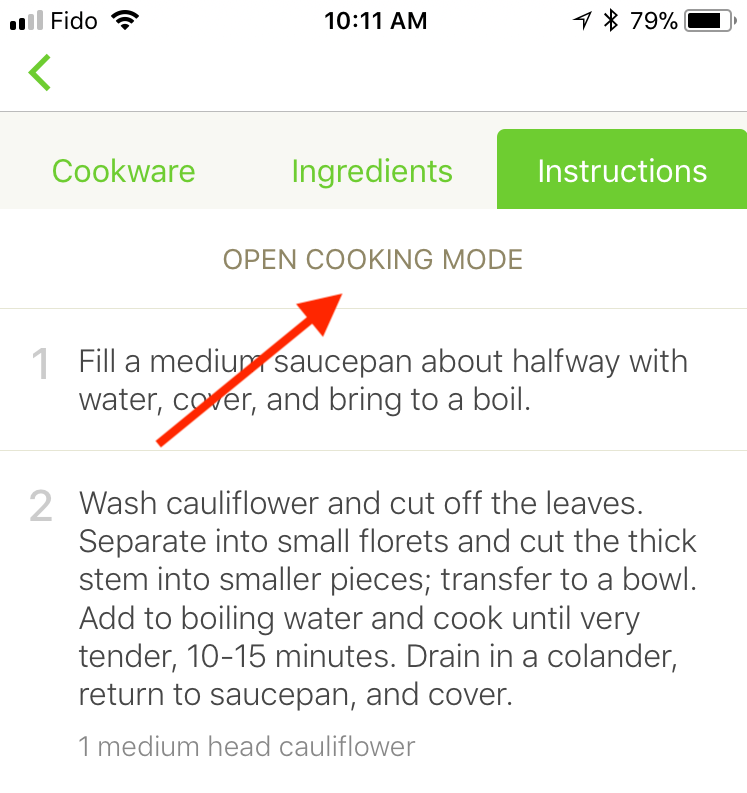 Once cooking mode is open, you can navigate to the next instruction by hovering your hand near the top of your screen. Hold your hand there until the down arrow fades, then move your hand away. The next instruction will then appear!